From the philharmonia.co.uk web site of the event. For years, I have had a love/hate relationship with Stanley Kubrick's "2001". As previously mentioned in my Bradford article, the film just doesn't work on the small screen. I struggled to watch the film either on DVD or TV, yet books relating to the film by authors such as Arthur Clarke and Jerome Agel were voraciously read as a teenager. A copy of the Rhino Records soundtrack CD found secondhand was a staple of my film music collection, yet staying awake during the film was a challenge. Full credits for "2001:A Space Odyssey"
Of course, seeing the film as intended does change things. What was once slow-moving and drowsy on the small screen held my rapt attention when shown on a massive curved screen, and a new appreciation for the film was found. 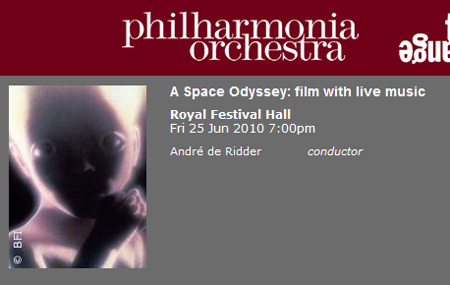 Living in London does afford a film nut chances not found in many other cities, so when the BFI announced plans to screen "2001" with the backing of a live orchestra on June 25, tickets were booked as soon as possible. The event was publicized as a 'world premiere', as Warner Bros. provided the BFI with a new digital print (not 70mm, sadly) with just dialogue and sound effects. To give the event the gravitas it deserves, Christiane Kubrick introduced the film while regaling the audience with stories about Stanley Kubrick's love for music and its place in the Kubrick household. She also said he would have been 'terrified' of this type of event. I was there. Over the years I have been spoiled by Kevin Brownlow and Carl Davis presenting Thames/ Channel 4 Silents. From Napoleon to The Phantom of the Opera via Ben Hur (1926) and Wings, I have witnessed their showmanship, professionalism, passion and sheer panache. They have always created a memorable evening. The same sadly, cannot be said for this washout. The evening was rescued by Christiane Kubrick who received a temendous ovation and paid moving tribute to her brother Jan. More than anyone, he has kept the Kubrick legacy flourishing. On the contrary, Mrs. Kubrick, on the contrary. Even in the last row of the balcony (quite literally the farthest point from the orchestra pit in the Southbank Centre), the power of the Philharmonia Orchestra and Chorus could be heard loud and clear. Seamlessly integrating themselves with the projected images, it made you wonder why no orchestra hadn't tried this before with the film. From the beginning notes of Ligeti's Atmospheres to the closing performance of the Blue Danube that doubles as the film's exit music, their performance made familiar notes come alive and the hairs on the back of your neck stand up. One hopes that other cities and orchestras get the chance to perform this, and soon. 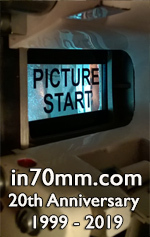 There are only a handful of venues in the world that can project "2001" in 70mm, but most major cities have an orchestra and I'd bet that most of them would leap at the chance to perform some of the best-known classical pieces with a film classic in the background. If the reception of the Southbank Centre crowd is any indication, then it's a sure-fire winner for any orchestra. I'm glad I got the chance to see it, and I hope you do too someday. The limits of Digital Projection were cruelly revealed by the bright lights of the music stands. No effort had been made to mitigate the washout effect. Of all the "Live Cinema" events I have seen, including special screenings of The Saragossa Manuscript at the NFT and Metropolis at the Barbican,, this was the least successful. Apart from playing the parts assigned to them, many members of the orchestra took little interest in the procedings. The public were amazingly forgiving. Here endeth the rant, however, I can produce a full review of this event if you so desire.